Barbecue sauce goes well with lots of meals. We eat it with this pulled pork recipe, but it's equally as lovely with chicken, prawns or anything straight off the barbecue. It will also keep for a couple of weeks in your fridge, so the recipe below makes enough for more than 1 meal. Don't let the list of ingredients put you off. This is a one pot sauce and not at all complicated. If you don't have mushroom ketchup, add extra Worcestershire sauce. 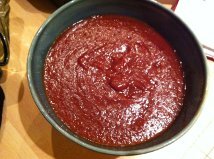 And if you don't have any tomato passata, you can use ketchup, but if you do this, you need to halve the amount of sugar you use. Heat the butter in a medium sized saucepan, over a medium to low heat. Chop the onion and garlic and add to the pan. They don't need to be chopped with any care, as the whole lot will be blended at the end. Cook the onion and garlic gently until they become translucent, about 5 minutes. Add the fennel seed and fry for 2 more minutes, stirring as you go. Now add the vinegars, tomato passata, Worcestershire sauce, mushroom ketchup, sugar, honey, herbs, mustard, paprika, salt and lots of pepper, and bring up to a simmer. Stir regularly and leave simmering for around 30 minutes, or until the liquid has reduced by half and starts to coat the back of a spoon. Remove from the heat and leave to cool for 5-10 minutes. Remove the bay leaves, and blend the sauce. Serve cold with whatever you like, and enjoy!